Forget the Beach. Join the Gnome Census. Sunbathing in Costa Rica? Rafting the Grand Canyon? Lounging in Moab? For Telluride, CO resident, Ken Fuhrer, the off-season choice was simple; counting gnomes for the first annual Gnome Census in Switzerland. 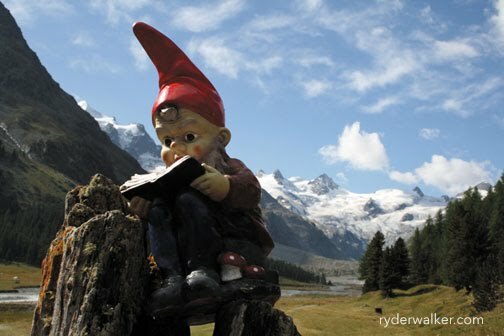 The Gnome Census, a collaborative effort between the Swiss Federal Statistics Office and Telluride-based Ryder-Walker Alpine Adventures, aims to get a handle on a demographic that appears to have changed dramatically in recent years. The Swiss government would like to know exactly how many gnomes they have, not only in Zurich, but also throughout the entire country. Schnapps admits that counting every gnome in Switzerland is a monumental task, and one that requires extra help. That’s how Ken Fuhrer got involved. Life took on new meaning for the gnomes when films like Amélie and, most recently, Gnomeo & Juliet objectified an otherwise private and somewhat elusive race. Ken Fuhrer wonders what the long term implications will be for the gnome population as a whole. “It seems like the film industry has given gnomes the traveling bug,” said Fuhrer. “Gnomes are a big part of Switzerland’s culture and tourism, but what happens if they start emigrating? There might be a day when we find more gnomes in Shanghai than St. Moritz, and that’s just wrong,” he added. Fuhrer plans to leave for Switzerland when Telluride’s ski resort closes. He’ll be working with Colorado-based hiking tour operator, Ryder-Walker Alpine Adventures. After reading about Ken's effort to voulanteer for the cause of gnome counting, my wife Porter and I immediately bought two roundtrip tickets to Geneva to join in. The way i see it we cannot have too many eyes on the trail. Yes! We can always use more volunteers. You should contact Mr. Schnapps at the Statistics Office. Your background in statistics could be quite useful.